FHC Barn Party: Saturday, November 10 from 4-9 pm, in the FHC parking lot. This is a great event to bring your family and to invite a friend. BRING FOOD – The church will provide hot dogs and buns but you need to bring CHILI, PIE, AND COOKIES*. We ask that everyone bring something. There will be a chili and cookie contest, but please bring food even if you do not enter the contest. You can bring either meat (beef, chicken, turkey) chili or vegetarian chili. BRING A CHAIR OR BLANKET – This is a completely outside event. BRING A FRIEND – This is a safe place for a friend to make first contact with FHC. DON’T MISS THE FUN! Petting zoos // bull riding // German carousel // face painting // bluegrass music // line dancing // human foosball // hay rides // AND more! * Chili Contest! You can bring either meat (beef, chicken, turkey) chili or vegetarian chili. Chili must be received by 5:30 pm. All children (12 years and younger) are invited to enter your homemade cookies into the cookie contest. Cookies must be received by 5:30 pm to be included in the contest. If you have NOT yet signed up to volunteer – we always need help setting up on Saturday morning/afternoon and tearing down after 9 pm. Thanks for all your help! 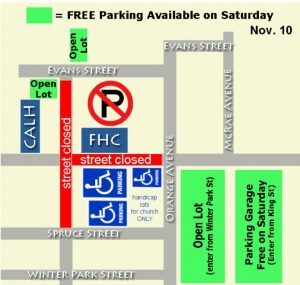 All FHC Parking lots will be closed during worship services (except for handicapped parking in the south parking lot) and the Barn Party. Parking Shuttle will be available at both of our worship services and the Barn Party!